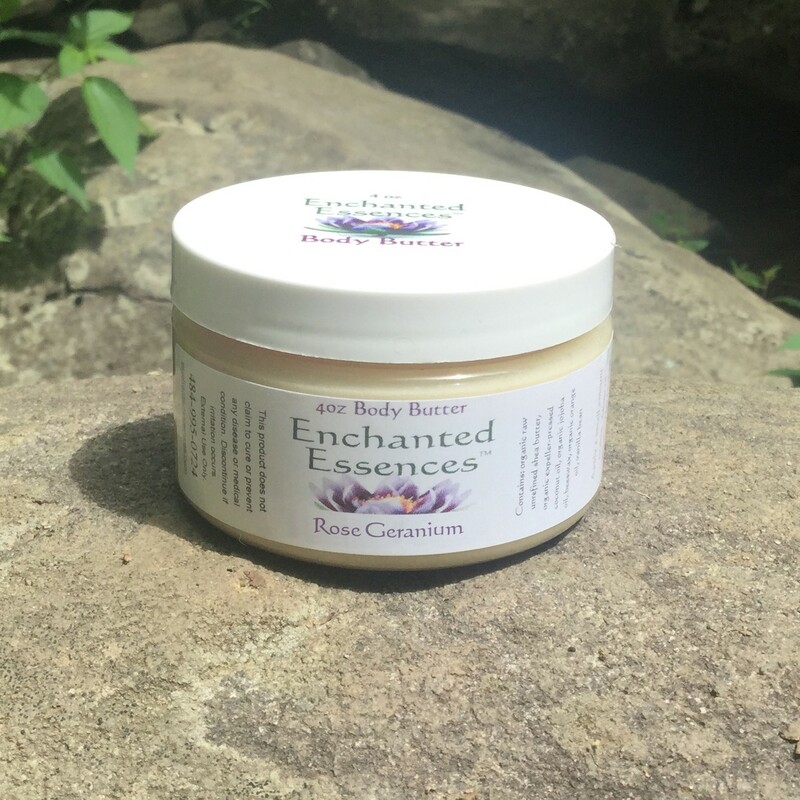 Rose Geranium Body Butter: 4 oz. No chemicals, No Toxic Fragrances. No preservatives. Organic ingredients. Excellent for dry skin and for use in cold winter weather. Use sparingly. A Little goes a long way. Handmade with Organic Raw Mango Butter, Organic Raw Unrefined Shea Butter, Organic Unrefined Cold-Pressed Jojoba Oil, Organic Cold Pressed Camellia Seed Oil, Beeswax, Arrowroot Powder, Rosemary Antioxidant, Vitamin E, and Pure Essential Oils of Bulgarian Rose and Geranium and/or Organic Botanical Flavors. Melts like butter on the skin. Moisturizing with natural ingredients. Note on the Botanical Flavors that we use in our handmade Body Care products: We do NOT use so-called "Natural Flavors" (also known as "Natural Analogs") which are actually synthesized in a lab. The Botanical Flavors that we use in our handmade products are Genuine, Food-Grade Flavors which are used for culinary, scent and cosmetic applications. The Flavors are cold-processed using extraction without the use of any colorants, fillers, diluting agents or preservatives. (obtained through a proprietary technology conducted at temperatures below 118 degrees F. This process comprises a multi-stage extraction encompassing initial desiccation, lyophilization, CO2 and HFC extraction). The Botanical Name of the Flavor is the only Ingredient in it. They are wildcrafted or sustainably grown and non-GMO. They are safe for your skin and they Smell Delicious!! !